A family-friendly church located in a suburb of Rochester, NY. For this project, I re-designed and developed a responsive website for the church. The old website was not responsive, making it all but unusable on mobile devices. It was also dated and unfocused. One of the first things I did was take a look at the website traffic. The analytics revealed many pages given prominence and attention that were rarely visited. As I began the project, I made a list of every page on the old site. I then visited dozens of church websites to find common organization methods. I also did some informal research, asking a few people where they would expect to find content. I then wrote the name of each page on Post-it notes, creating a physical sitemap. One page at a time, I re-organized the site into new sections to make content easier to find for visitors. After creating a proposed sitemap, I analyzed the site content and focus. I also evaluated the content on the homepage. Based on that research and planning, I created new design options for the site. After getting client approval on a proposed design, I began building the site. The final design incorporates the church logo, color palette, and personality. The photography I selected conveys a warm, welcoming greeting to first-time visitors. As I built the new site, I went page by page through the old site content, updating and refining it. I used the Bootstrap framework to build the new site. This ensured accessibility and performance across various browsers and devices. Also based on my research, I created a new section of the website. This section, Visit, contained information for first-time visitors. I organized it into three pages: Location and Service Times, What To Expect, and Plan Your Visit. Open Door used paper forms for common requests. These included bulletin announcements, meal delivery, and sign language interpreters. The paper forms were then digitized by an administrative assistant, and emailed. To streamline this process, I created forms on the new website to intake this information. 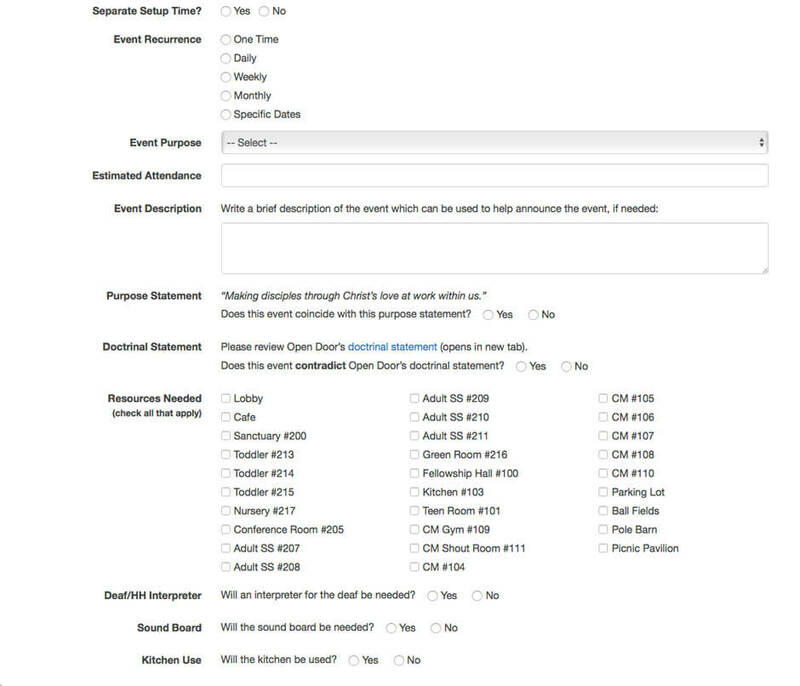 The forms only display the fields necessary for the specific type of request. This reduces errors and fatigue. The forms also offer client and server-side validation, which reduces errors and omissions. The information is then emailed to the approver, saving time and effort. Completing this project was a win for both the requestors and the approvers. Not only was it more convenient, but it was also much more efficient. 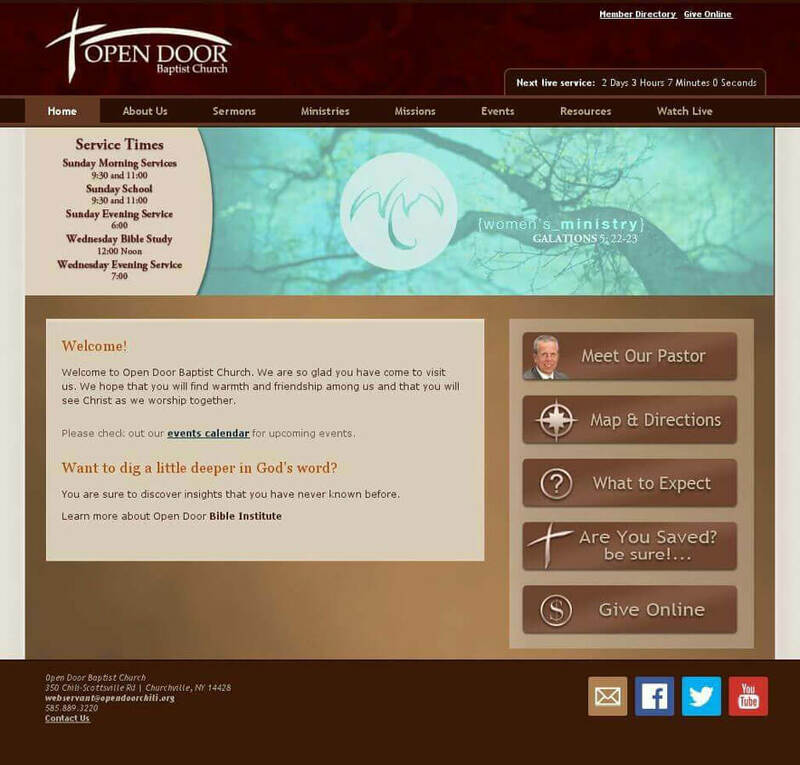 The new website received positive feedback from Open Door Baptist Church. Staff and members appreciated the redesign and content updates. Visitors remarked how the new site was influential in their decision to attend. The new site also presented a learning curve. It required members to learn a new site navigation and organization. This prompted insightful feedback, which led to further improving the navigation.